One million pinecones. Not really. Bags of Pinecones (Dollar Tree). Mix in pinecones. I used some pre-glittered and gold Martha Stewart pinecones that I purchased from Home Depot. Spray paint (your choice of color). I used Krylon Metallic Spray Paint in Gold Metallic. So I skipped displaying Step 1. I figure you all are brilliant people and did not need to see the process of me spray painting all of the supplies. 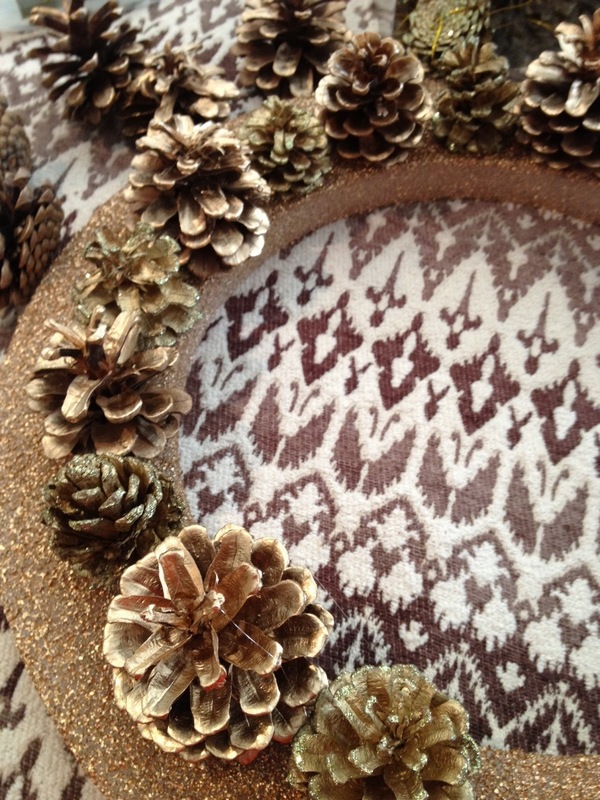 Anyhow, you will spray paint the wreath form and all of your pinecones. Start affixing all of your pinecones on the interior of the wreath. It is the easiest starting point and all of your pinecones will be able to rest clear on the space. Once your first row is complete, move to the exterior. Once that is complete, you will need to secure pinecones on both the inside and outside of the wreath form. This is where it gets tricky. Since no pinecones are the same or alike, some of the cones will not secure nicely for you. The mix in pinecones leant themselves to be very helpful and useful in this case. They are smaller, and they have a protrusion at the bottom of them. I used this to secure the pinecone into the styrofoam. Hang. Admire the fact that you did it yourself. Disclaimer: I only burned my fingertips on 3 occasions this project. Progress people. Progress. What do you think? Super simple, right? We cannot wait for you all to give it a whirl. Please send pictures our way once you do. Would love to see it completed in other colors as well! I am toally in love with this! Never have I seen pinecones looked so glammed up....totally fabulous!! So beautiful! It looks very expensive! I like the gold against the color of your door. Very sharp. Gorgeous gorgeous! I'm loving all the gold and glitter! This is stunning! I have made my own wreaths out of moss, but pinecones may be in my future! You have a lovely design sensibility. I'm following you after finding your blog from Suzy's link party.